We work collaboratively with our partners. If you are a graduate we can assist you if you are still on an undergraduate or postgraduate degree or not more than one year since graduation. We believe that we should get to know you more so we would love to speak with you by skype or telephone and here about your educational travel plans, where you would like to go, the type of experience you would like and what you would like to learn. Please do get in touch with us on administration@gemplacement.co.uk. We can fix a time to talk to you. We can then put a plan in place to help you involving some of our key partners. We can help you with quite a few countries. Please connect with us and we can discuss further. Please click here to see some of the key scheme information for coming to the UK, Maldives or UAE. We would like to share with you some of our graduate experiences. So that you can see the benefits and experiences. A Russian National in the UK via GEM Assistance and Support: Daria underwent a marketing internship with an International Branded hotel and now owns a hotel in the UK. "Since I have decided to use the service with GEM, I have to say I believe I am on the right track to achieve my career goals. Now that I am undertaking practical training with a big company with a multinational office and future possible career growth, I know I have made the right decision by working with GEM from the very beginning. "I would definitely recommend this company - GEM - to any of my friends or people I know who would like to build their future career. GEM could definitely put a few first bricks for you to build your own sky-scraper." 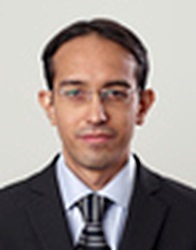 Haseeb worked for many years to achieve his ambition to travel overseas and gain an education. "My name is Haseeb. I am from Mumbai, India. I got in touch with GEM through a Skype interview. Through GEM I received a training in London to do my management training. GEM has supported me on Government Authorised Exchange. This was a smooth process. GEM has been very helpful in guiding me about rules and regulations, social life in London, where to find accommodation, travelling, places to visit and in general life in London. GEM also does a background check on the students where they are doing their training or if they have any problems and are in constant touch with the students. It's been a pleasure knowing them as their expertise makes life slightly easier for overseas students in new countries." Pictured here are Rabikanta and the Placement Manager Mrs Sue Young, at a central London Hotel. He has recently completed his 6 month internship working in the UK's most thriving Capital, London, where he is located on the London Docklands along the Financial Centres, including the famous Canary Wharf, and is close to many of London's favourite hotspot including the O2 Arena. 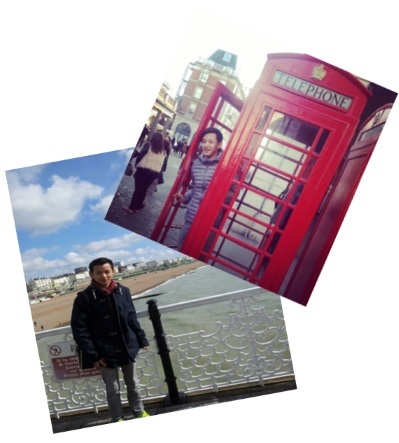 He has thoroughly enjoyed his time here in the UK, and has kept us informed of his recent endeavours, including his trips around the Capital and Brighton; take a look at his recent snapshots. We provide ongoing support from the moment you register with us onto the scheme to when you finally arrive at your destination, and we will frequently drop you an email to see how you are getting on, and hey even visit you at your hotel. We are here to support you every step of the way and we are only one phone call or email away and our support has not gone unnoticed as Rabikanta had this to say. "Thanks for your kind support and taking care during my training. I am enjoying the weather and training is going on great as usual. I have learned a lot and it's been very satisfying experience so far". Jingye from China is currently studying at a top Hotel Management School in Switzerland and has also recently completed her internship in the UK as a Front Office Trainee. "At the first day I've met Mrs. Sue and HR together in our hotel, we've met each other and she gave me a lot tips to live in London. GEM is helping me all the time though my internship and always keeping controls for whole application procedure. Even I'm holding Chinese passport that sometimes not so easy to go through but they make that no complicated at all". 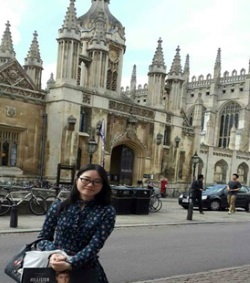 It hasn't been all work and no play Jingye has managed to take in some of the sites the UK has to offer including London Bridge, Cambridge and Sheffield to name a few take a look at some of her snapshots below. 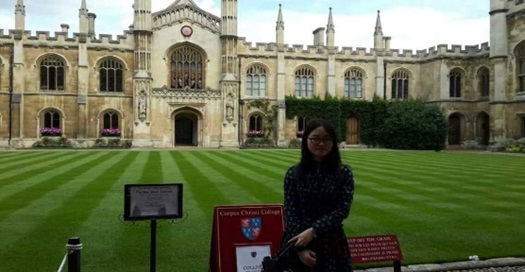 Jingye at Corpus Christi College in Cambridge. Hongna is currently undertaking her internship at a hotel and spa resort, in the beautiful Maldives. A recent graduate from the Hotel Management School in Switzerland she is currently working as a Front Office Trainee, and dealing with international guests of a daily basis. She has found life in the Maldives brilliant and has made new friends. The Maldives offers a good training programme and various activities are also on offer when you are not working in which Hongna has managed to take advantage of. Take a look at some of her pictures below.